I sliced some strawberries and covered them in a little sugar and a splash of lemon juice. I used my handy-dandy immersion blender to make it nice and smooth. I put some blueberries in a saucepan with a little bit of water and a little sugar and boiled it for about 5 minutes. I also blitzed the blueberries with my immersion blender. I put both purees through a strainer. I added a bit of each puree to a bowl of vanilla yogurt. I mixed it around just enough to get these gorgeous swirls. I put the rest of the purees in the fridge for pancakes. I poured the berry-yogurt concoction into my star molds. I really have to stop going into Sur la Table. I always walk out with a new kitchen treat. I put the sticks into the molds and put them into the freezer overnight. You can make your own molds using lots of different things if you do not have star molds laying around. Ice cube trays, paper cups, craft sticks, plastic spoons. I know that you can come up with something. 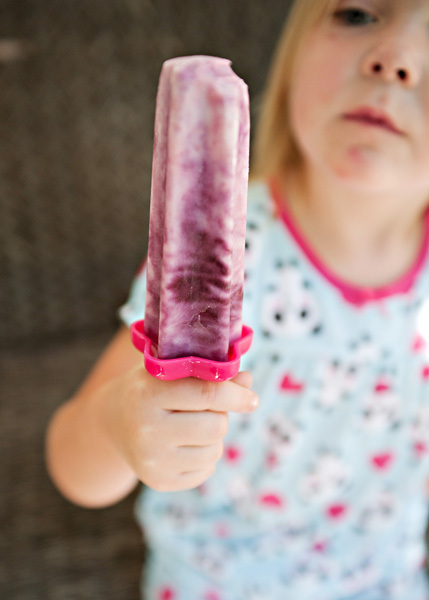 Unmold and enjoy a delicious and healthy popsicle on a hot summer day.